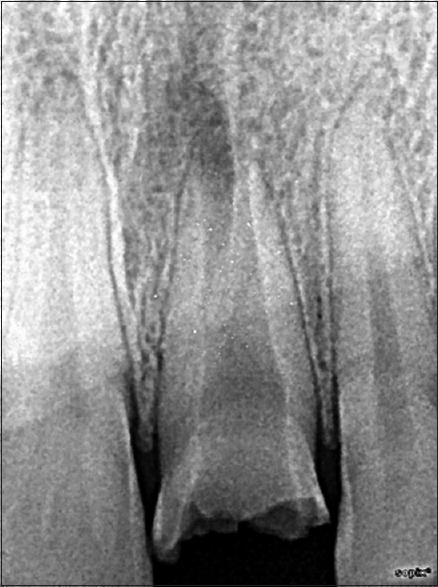 Apexification is the process of induction of calcific barrier across the open apex or the continued apical development in an immature tooth with infected necrotic pulp. 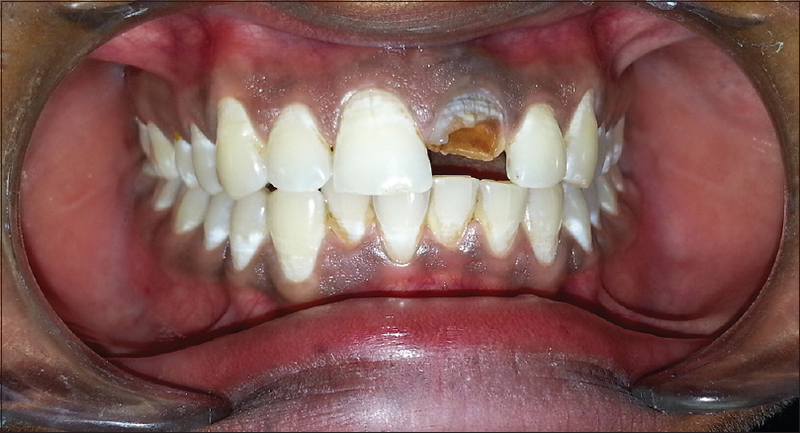 The presented case was of a 19-year-old male patient with discolored and fractured upper front left tooth and open apex. Immature permanent teeth pose difficulties during endodontic treatment because of the wide-open root apex and thin dentin walls. This article describes single-visit apexification using Biodentine, a new calcium silicate-based material as an apical barrier along with platelet-rich fibrin as internal matrix. 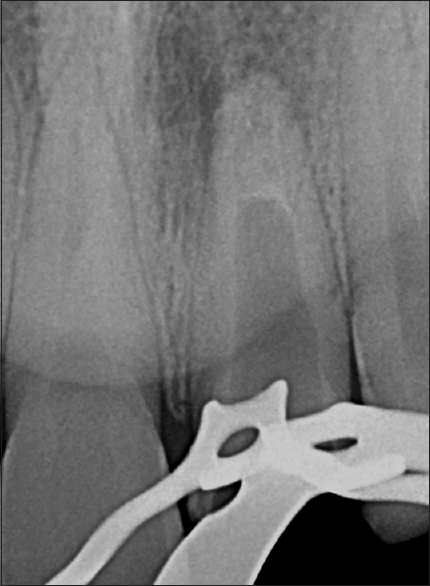 Apexification is the process of induction of calcific barrier across the open apex or the continued development in the apical region in an immature tooth with necrotic pulp. 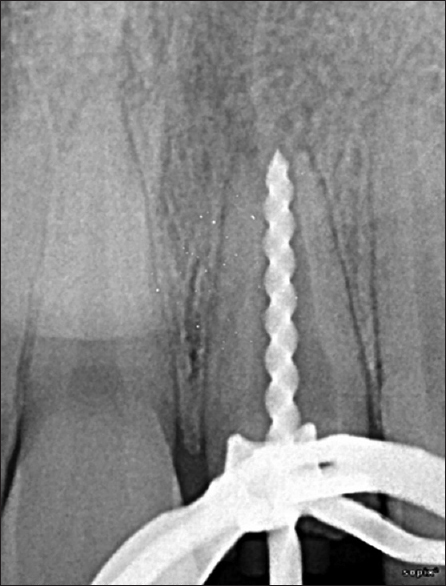 Traditional approach of apexification procedure involves the induction of formation of an apical barrier while, in the recent times, an artificial apical barrier is formed by the placement of various materials which included tricalcium phosphate, freeze-dried bone, freeze-dried dentin, and mineral trioxide aggregate (MTA). However, these materials tend to extrude beyond the apex impinging on the periodontal tissue. The placement of an artificial barrier or a matrix provides an apical stop against which sealing material can be placed and packed. Several materials proposed to create a matrix include calcium hydroxide, absorbable collagen, hydroxyapatite, and autologous platelet-rich fibrin (PRF) membrane. In recent times, MTA has gained considerable attention for single-visit apexification. Nevertheless, MTA remains subject to some concerns such as its long setting time, poor handling characteristics, and possibility of staining of tooth structure. Recently, a new calcium silicate-based material, Biodentine (Septodont, France), has been introduced which was designed as a “dentin replacement” material with properties similar to MTA without its disadvantages. The aim of the present article is to report the successful closure of root apex in a pulpless permanent maxillary central incisor with wide-open apex using Biodentine in combination with a PRF as matrix. A 19-year-old male patient reported with a chief complaint of discolored and fractured upper front left tooth. Patient gave a history of trauma 4 years back. Intraoral clinical examination revealed discoloration and Ellis Class IV fracture with relation to #21 [Figure 1]. The patient gave no history of swelling or pus discharge. No other significant dental or medical history was found. Radiographic examination revealed an immature wide open apex [Figure 2]. Tooth was not tender to palpation and percussion. Thermal and electric pulp test gave a negative response. Following rubber dam placement, access opening was done and working length was determined radiographically 1 mm short of radiographic apex [Figure 3]. Cleaning and shaping was performed with K-files (Mani, Prime Dental, Mumbai, India) using conventional preparation technique. Root canal irrigation was performed with 3% sodium hypochlorite (NaOCl) between change of instruments followed by 17% ethelynediaminetetraacetic acid (EDTA) (Prime Dental, Mumbai, India) and saline. Root canal was then dried with sterile paper points. Calcium hydroxide (Metapex, Meta Biomed, Korea) was placed in the root canal, and the access cavity was sealed with cotton pellet and Cavit G (3M ESPE, Germany). After 4 weeks in the subsequent appointment, under isolation, calcium hydroxide dressing was removed by H file and irrigating with alternating solutions of 3% NaOCl and 17% EDTA. A final irrigation with sterile saline was done. The root canal was then dried with sterile paper points (Meta Biomed, Korea). Simultaneously, PRF membrane was prepared. A 10 ml sample of whole blood was drawn and transferred into a 10 ml sterile glass test tube without anticoagulant and was immediately centrifuged at 3000 revolutions per minute for 10 min. The resultant product consisted of three layers: topmost layer consisting of acellular platelet poor plasma, PRF clot in the middle, and red blood cells at the bottom. The freshly prepared PRF membrane was placed into the root canal and gently compacted using hand pluggers to achieve a matrix at the level of the apex. The mixed Biodentine was carried into the canal with the help of amalgam carrier and was condensed against the PRF matrix using hand pluggers. Several increments were required to form an apical plug of 4 mm thickness, which was confirmed radiographically [Figure 4]. After 12 min, the hardness of the Biodentine was checked using a plugger to confirm its set. The canal was backfilled with thermoplastized gutta-percha (Calamus Dual, Dentsply Maillefer, Switzerland) with AH Plus resin sealer (Dentsply DeTrey, Germany) [Figure 5]. The tooth was immediately restored with a composite restoration (Tetric N-Ceram, Ivoclar Vivadent), and in subsequent visits, metal ceramic crown was placed [Figure 6]. Six-month follow-up revealed the patient remained asymptomatic with restored esthetics and functions. 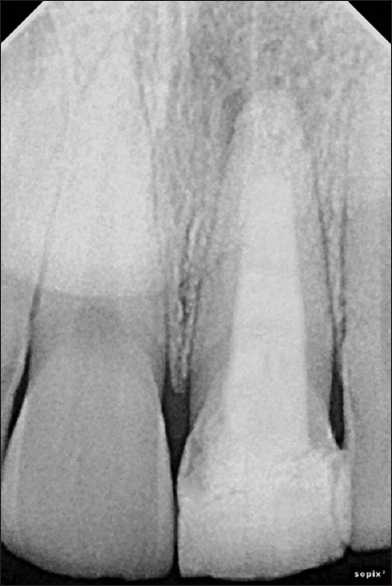 Immature necrotic permanent teeth pose difficulty during endodontic treatment because of the wide-open root apex and thin dentin walls and periapical tissues may be traumatized due to overextended root canal fillings. Induction of apical closure may take more than 3–4 months requiring multiple appointments. The setting time of Biodentine is around 10–12 min which is shorter than MTA. Calcium and hydroxyl ions released from set material interact with phosphates forming crystalline precipitates giving Biodentine a marginal sealing ability. Biodentine induces mineralization by expressing markers of odontoblasts and increases transforming growth factor beta 1 secretion from pulpal cells. PRF is another alternative which can be used as an internal matrix over which the sealing material can be placed. PRF consists of leukocyte-PRF matrix composed of a tetramolecular structure with cytokines, platelets, and stem cells within it which acts as a biodegradable scaffold that guides epithelial cell to migrate to its surface. The cells involved in tissue regeneration may be carried by PRF and release growth factors in a period between 1 and 4 weeks. The use of Biodentine in creating a calcific apical barrier explores a new paradigm in the field of apexification. The excellent biocompatibility, hydrophilic property, tighter seal, and shorter setting time of Biodentine make it a promising material for single-visit apexification. Trope M. Treatment of immature teeth with non vital pulps and apical periodontitis. Endotopic 2007;14:51-9. Lemon RR. Nonsurgical repair of perforation defects. Internal matrix concept. Dent Clin North Am 1992;36:439-57. Parirokh M, Torabinejad M. Mineral trioxide aggregate: A comprehensive literature review – Part I: Chemical, physical, and antibacterial properties. J Endod 2010;36:16-27. Parirokh M, Torabinejad M. Mineral trioxide aggregate: A comprehensive literature review – Part III: Clinical applications, drawbacks, and mechanism of action. J Endod 2010;36:400-13. Rafter M. Apexification: A review. Dent Traumatol 2005;21:1-8. Shabahang S. Treatment options: Apexogenesis and apexification. J Endod 2013;39:S26-9. SeptodontBiodentine™ Active Biosilicate Technology™. Scientific file 2010. Camilleri J. Characterization of hydration products of mineral trioxide aggregate. Int Endod J 2008;41:408-17. Borie E, Oliví DG, Orsi IA, Garlet K, Weber B, Beltrán V, et al. Platelet-rich fibrin application in dentistry: A literature review. Int J Clin Exp Med 2015;8:7922-9.